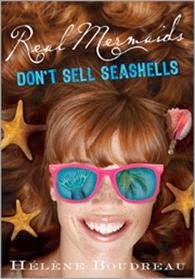 Real Mermaids Don't Sell Seashells: Promo and Giveaway! Teenage girls have to deal with a lot of tough firsts. First zit. First crush. First... mermaid’s tail? In the fourth installment of Hélène Boudreau’s breezy, fun and “unputdownable”Real Mermaids series, our favorite mer-girl Jade can’t think of a better way to celebrate peace in the underwater mer-world than with a tropical vacation in the Bahamas with her family and BFF. Soon, Jade is enjoying the tropical sunshine, all-you-can-eat buffet, and island day trips. But when Jade gets lost in the island’s famous waterfront Straw Market, something doesn’t feel quite right. A body splashes into the water as a cruise ship enters the harbor and a teen boy selling conches from his boat behind the market knows more than he’s willing to admit. With no body, no leads, and no other witnesses, though, the local police don’t seem too concerned. Maybe Jade’s imagination has been acting up on her, just like Cori said, considering everything she’s been through in the past few months. But with Mom and Dad off on a honeymoon excursion it wouldn’t hurt to check things out, would it? Little do Jade and Cori realize, they are about to uncover more secrets about the splashing body, dangerous cruise ship cargo, and more questions than answers lurking in the nearby Caribbean waters. Sounds like a fun story and one to read just for the pleasure of reading. I am looking forward to the secrets and the suspense. Mermaids. I have never read a YA mermaid book. Tease by Sophie Jordan: Promo and Giveaway! Purple Girl by Audrey Kane: Promo and Giveaway! Ava and Pip: Promo and Guest Post! Blind Mercy: Promo and Giveaway! Shadows of Damascus: Promo and Giveaway! Pieces of Me by Amber Kizer: Review and Giveaway! Sky's End: Promo and Giveaway! Create a Powerful Life Plan: Promo and Giveaway! Small Change: Promo and Giveaway! An Unlikely Goddess: Guest Post and Giveaway! Tom's Wife: Excerpt and Giveaway! Romance Is In the Air Giveaway! Alienated Launch Day: Promo and Giveaway! Grasshopper Jungle: Promo and Giveaway! The Enchantress of Lynniah: Promo and Giveaway! A Burning Truth: Promo and Giveaway! Muse Unexpected: Promo and Giveaway! The Unremarkable Squire: Promo and Giveaway! Guest Post and Promo: Maya Rodale!